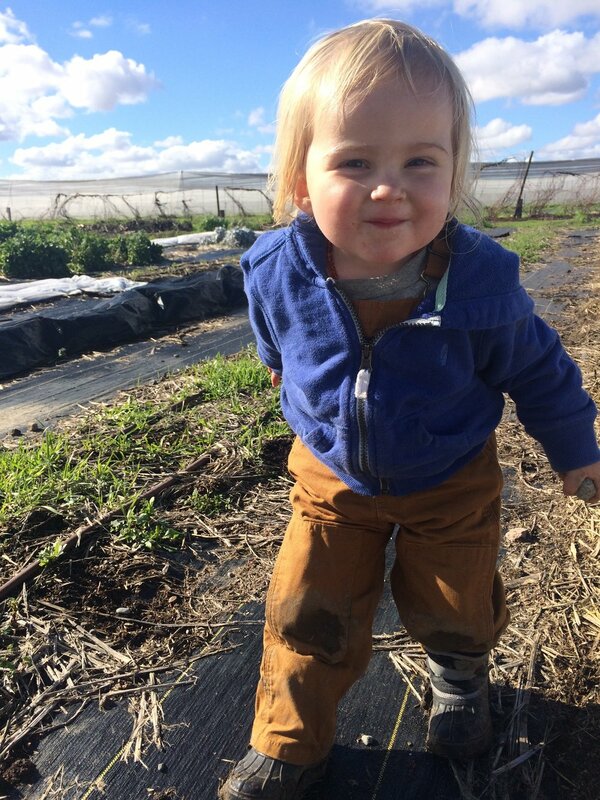 I am currently renting farm land separate from where I'm living, so when I'm getting ready in the morning to farm with my son, it is crucial i've considered all these things to bring. I'm going to list some of my must have materials to make your farming experience with a little one go a lot smoother. There are many types of carriers, I'm not saying the Ergo is the best (I haven't tried them all), but I do know that it's really easy to assemble unlike a wrap. Note that your baby, depending on size, should not go into the Ergo or similar type carrier prior to 3 months old, unless they have the infant insert. But, the infant insert gets really hot, so I've had momma's tell me they prefer a rolled up towel under baby's bottom with the Ergo carriers. The easiest way I've been able to farm and keep my little guy, Nalin, happy is by having him in the carrier on my back! This frees my hands to do whatever, and he LOVES being carried. As an almost 2 year old, he's getting pretty heavy now, but these carriers last! Some babies do not like to be worn. They rather be pushed. If that's the case, a stroller may be your most used baby item at the farm. Make sure your pathways are wide enough for the stroller (mine are 2 ft wide) and I suggest getting a BOB stroller with a fixed front wheel. They have thicker wheels for rougher terrain and the fixed front wheel will ensure the stroller doesn't have a mind of it's own when going over bumps. This is critical for a wee-one. If you don't have natural shady spots near where you are farming, then consider a pop up tent or one of those half dome tent shelters to create shade. This can't be emphasized enough! Mostly for toddlers. Babies, after 6 months are relatively bold with eating just about everything you give them. However, toddlers can be particular and they can also eat like teenagers. Pack a variety or snacks and in more quantity than you think you'll need. You can always eat the snacks your baby refuses. Win, win. Your babies favorite toys at home will not be his favorite toys on the farm. You might just loose them, so don't even bring them. Instead, bring mini versions of whatever you're using that day. They aspire to be just like you and they want to copy you! If you're planting, give him a mini kid sized trowel. If your harvesting, give you little one a small bucket or a basket to put things in. I give Nalin a small bucket of water and some flower stems I don't plan on using while I'm harvesting. As he's gotten older, I've been able to hand him stems as I harvest and ask him to put them in mama's bucket. He's usually happy to help! Include your little ones as they get older. They will be your best farm hands in the future. We have these things at home, so I don't have them at the farm but Nalin could spend hours in a sandbox or standing up at a water table and playing. Water play is especially really nice in the summer when it's hot. Think about setting these up in the shade near your farm to keep your little one occupied while you work. I would purposely take Nalin to the farm around his nap time. If I could get him to sleep on the farm, I could have 1-2 hours to hustle and get work done! He used to sleep in a pack-n-play in the shade. I didn't suggest this earlier because they're bulky and awkward to move, set up, and take down constantly. A wagon works much nicer, but also here is a secret: when it got really hot out, I'd let him sleep in his carseat with the car running, AC on, and soft music playing. I plugged the baby monitor into the car and could hear when he woke up. He was always cool and comfortable. I never had any problems except that it is totally not ideal to leave your car idling. I can't recommend this for obvious reasons, but it works, and hey- we do what we've gotta do! Know that it will take you twice as long to get tasks done. I figured this out pretty early on. A lot of farmers know, roughly, how much time it takes them to harvest a particular crop, pack for CSA, or plant a row, etc. Now, realize that with a baby or toddler in tow, these same tasks will literally take you twice as long. You have to be okay with that and to set realistic expectations for yourself. Be easy on yourself. You are farming AND parenting. Each is hard in its own right, and you are or will be doing both. Have fun with it, stay positive, and always remember- your baby comes first!